A beginner's guide to branding a conscious, creative business. We're the dreamers, the doers, the ones who can see things differently. A vision for a life and business that makes your heart sing. Living a life that completely aligns with your values. Doing work that creates waves of positive change in the world. Running your own business that vibrates at your unique frequency. You lack the clarity and confidence to communicate your vision to the world. Visionary Branding Course uses video lessons and live quarterly Q&A sessions to teach you how to create a values-aligned brand strategy for your conscious business. I'm not going to teach you every aspect of design and branding - that would be incredibly overwhelming and time-consuming. Instead, you'll receive simple, practical tutorials on the basics of brand strategy and design. You’ll learn how to make your business align with your vision and values and how to translate that unique vibration of your brand into beautiful visuals like a logo, social media graphic templates, and more. I desire to help you build a business that supports the vision in your heart. The best part? You’ll no longer be living a life where your business is stuck in a dream-state. Your business will be alive and vibrant, ready to grow and thrive! This Winter, the course will go live and the second group of Visionary Branders will begin their journey through the course. The modules are all uploaded and ready to go dive right into. This creates a dynamic that works for you — whether you like to binge on your brand over a weekend or work through every module with time and space. We’ll also meet live quarterly for Q&A, so you can receive on-going support for every module. All the Q&As will be recorded and available to you to watch in our resources page (in case if you can’t make one live). You’ll be able to meet the other folks taking the course with you and ask me questions about your process, brand strategy, designs, websites, etc. The course content is broken down into four main modules, designed to transition you easily from your brand foundation to designing your new brand identity. This course takes you from a foggy business idea to a clear vision of your business with a custom brand strategy that is beautiful, professional and made up of who you truly are. My name is Nadia Payan, and I'm a crazy intuitive, a graphic designer, brand strategist. I've had 6 years of formal training in advertising, strategy and design and over 10 years of experience in advertising and marketing strategy, campaigns and design working with big box brands for big box advertising agencies. The problem was that these brands were not aligned with my values. They had no soul. Since launching my business in 2015, I have collaborated with dozens of businesses to create brand strategies and designs that are steeped in meaning and purpose. These conscious business owners have one thing in common: They all desire to live a life of meaning, impact and positive change. I believe that if folks created businesses from their innermost desires, the world would be a better place. When businesses are created from a space of values and positive impact, magic happens. Visionary Branding Course came to life because my innermost desire is to be a part of the conscious business movement by helping others (like you) launch their businesses so that they can begin their own positive impact on the planet. I also know when you first embark on your entrepreneurial journey you just don’t have thousands of dollars to invest in custom design (yet!). So this course is available to you at an affordable investment - one that you can make happen even if you haven’t made your first sale. You’ll finish this course with clarity on your brand strategy along with supporting designs… all in the name of you making a living through creating positive change. 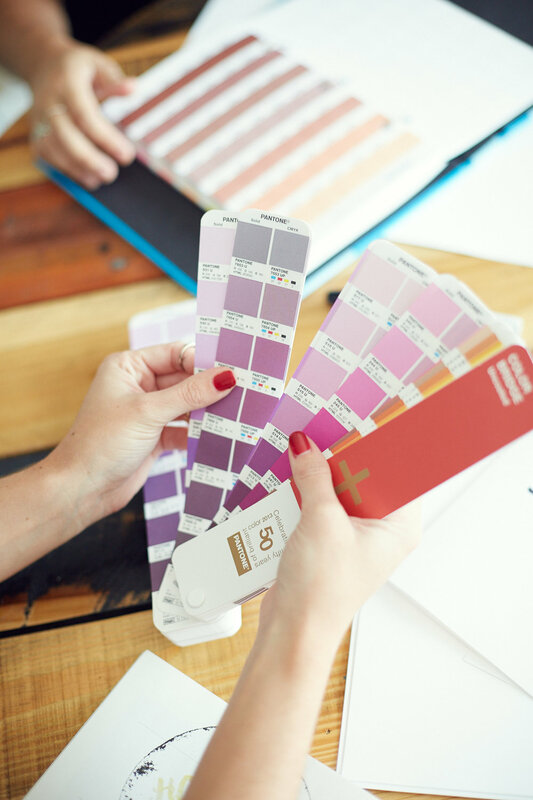 If you run a creative business, you'll run across brand design needs on a consistent basis. This course will equip you to create branded graphics as those needs arrive. Custom blog graphics and media kits have the potential to level up your blog and make it more professional. These items can set you apart from the millions of other blogs out there. For those whose work spiritual work and healing, creating a consistent brand will only amplify the reach of the work you already do. This course will equip you to create branded graphics as the need arises in your business. Whether you're a calligrapher, illustrator, hobbyist, photographer or painter, the ability to present yourself in a way that is aligned with your artistic and also professional, will open you up to great opportunities in an increasingly digital age. I believe that we expand to fill the containers with which we are greeted. Travel has played such a huge role in my life — it's allowed me to see beyond myself and connect with people from all walks of life. Travel is my lens to humanity. Enter Nyah Project - a Miami-based non-profit organization that provides fellowships for diverse youth from underserved communities to experience worlds beyond them and discover their true purpose. 10% of all revenue made from every sale of Visionary Branding Course will make its way to supporting Nyah Project. This means for every sale of $380, $38 will go to getting these high schoolers out to see the world.